The Radz co-branded licensed Skate collection is made up of the top skate brands: Santa Cruz, Real, World Industries, Foundation, Spirtfire and many more! 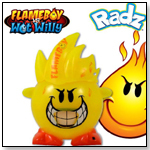 The Radz Series One (Grinder Series) collection includes six characters: Spitfire, Turtle Face, Roskopp, Flame Boy, World-At Night, and Monster Face. Each Skate character comes with a candy refill pack and a mini poster featuring iconic skateboard graphics. Radz candy is gluten-free, peanut-free, and kosher certified so it’s safe for everyone to enjoy. To operate, pull the character’s hair or hat back and the tongue pops out with candy! All Radz hair and hats are interchangeable so as fans collect more Radz, they can mix and match to create their own unique characters.